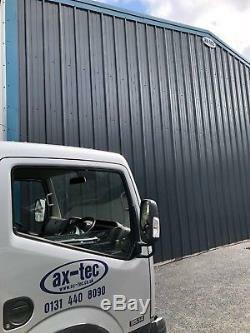 Ax-Tec are Edinburgh based and design, supply and install Steel Framed buildings locally. Throughout Scotland including the Highlands & Islands and UK wide. 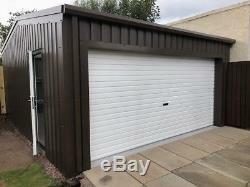 Steel framed double garage kit perfect for Race and Rally Car storage and workshops. 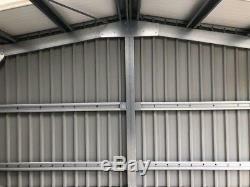 6m x 5m x 2.5m to eaves giving ridge height of 2.9m. 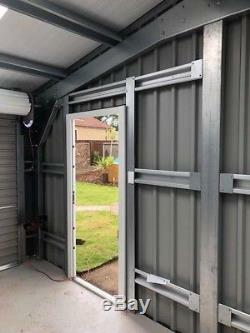 Fully galvanised steel portal framed structure. AS30 Steadmans Posco 0.7mm single skin roof cladding. AS30 Steadmans Posco 0.5mm single skin wall cladding. Anti-condensation barrier on roof sheets. 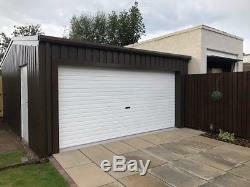 Choice of 6 cladding colours - this one is in Vandyke Brown with white roller and PA doors. 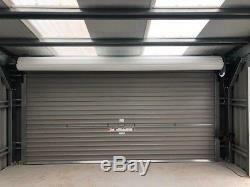 1 x industrial spec 240v electric roller door 4,370 x 2,100 in Van Dyke brown. 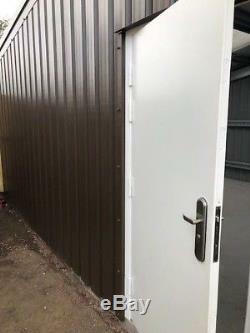 1 x PA entry door All gutters and rain-pipes All flashing and fixings to suit. Complete building ready for assembly. Photos are of actual buildings we have supplied and built. The list goes on and on. We can build and design your perfect Steel Building. We have supplied bespoke steel structured buildings right across Scotland including the Islands and throughout the UK. 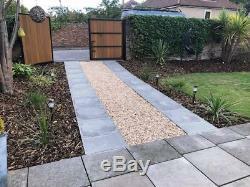 We can supply in kit form or arrange everything including all ground works. Give me a call today with your requirements for an exact price for your building. Ax-Tec are based in Edinburgh and we have been designing and building steel structured buildings since 2007. We work with customers right across the country including the Highlands and Islands. Ax-Tec is a family owned company and we really pride ourselves in offering a one to one personal service on every single project. If you are thinking of a new build Steel building get in touch. Give us a call, it's always good to talk! The item "Steel Framed Double Garage kit Ideal Workshop Shed for Rally Race Motorsport Car" is in sale since Tuesday, September 11, 2018. This item is in the category "Business, Office & Industrial\Agriculture/Farming\Other Agriculture/Farming". 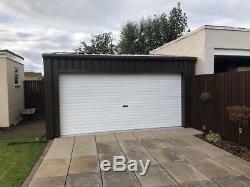 The seller is "ax-tec_steel_buildings" and is located in Loanhead. This item can be shipped to United Kingdom.